Radiator pressure testers are an efficient and accurate way to determine the common reasons for automotive overheating (Source). A quality radiator pressure tester will be able to pinpoint the exact cause of external leaks frequently originating from leaky hoses, loose clamps and connectors, water pumps or radiators (Source). Determining radiator system leaks will enable you to quickly change coolant and assess whether other automotive repairs need to be made (Source). Overall, the best option we've seen, based on buyer feedback, is the Astro Radiator Pressure tester. It ships with the most number of adapters (17), with professional and backyard mechanics saying there is always a way to connect to your vehicle. The Astro Pneumatic Tools radi﻿﻿﻿ator pressure tester is marketed as an easy way to diagnose leaks in radiator systems. It has a test range of 0 - 35 psi (0 - 2.5 bar). It's one of the more robust and dynamic options- buyers say it works on a range of foreign and domestic vehicles because of the 17, color-coded test cap adapters it ships with. Its vacuum purge & refill tool connection is engineered to fit nearly all of the different types of radiator openings. It's indicated for a ton of different car brands including: Mercedes Benz, GM, Subaru, Jeep, Peugeot, Nissan, Mitsubishi, Chrysler, Acura, Citroen, Mazda, Toyota, Infiniti, BMW, Geo, Volvo, Isuzu, Honda, Suzuki, Lexus, Saab, Renault, Mini Cooper, Fiat, Alfa, VW, Ford, Opel, Porsche, Audi, and more. One of the best things, he has written, about the Astro radiator pressure tester kit is the refilling system which he writes would cost upwards of $200 alone, but is included with this particular system. The refilling system is slightly slower because of the 3/8 line that the Astro uses as compared with 3/4 lines, but it is definitely faster than funnel filling. Other users have written that it has paid for itself many times over- definitely a valuable purchase for automotive technicians or just a car tinkering hobbyist. One buyer purchased this radiator cooling system pressure test to examine several expensive foreign cars he owns, saying he preferred to learn how to service his own vehicle as opposed to paying for an expensive factory servicing. Since he has done so much work on the car on his own previously, it only made sense to invest in a pressure test kit that he could learn how to master as a DIY mechanic. The way he used it, he applied the pressure test kit, pumped up the pressure to the indicated level, and all of a sudden a stream of coolant spewed from out of his car is a hosing- he was able to immediately detect and then fix the problem, saving a ton of money in the meanwhile. Another novice mechanic told us that he purchased his radiator pressure test kit to help them diagnose his Ford sports utility vehicle, saying that some of his friends that are mechanics told him it would help him to diagnose leaking and overheating problems his vehicle was experiencing. Another reviewer was somewhat less impressed, saying that there are a variety of different coolant testers on the market, and there seems to be a race to the bottom- with many many manufacturers producing low-priced and inexpensive options of questionable quality. He says that since the pump is made out of plastic it's a solid option if you're going to use it only occasionally- he also says that the adapters which are designed to provide a dynamic fitting, don't always fit all types of vehicles. Other reviewers say that it was a true life saver, helping them to detect leaks in the cooling system, which saved them a considerable amount of time and money knowing which parts they had to fix and replace. The second cooling system and pressure tester we examined is manufactured by Stant. 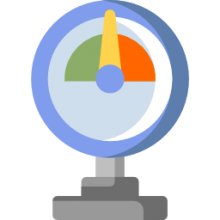 It's marketed as a capable automotive assessment tool designed to work with modern vehicles higher pressure cooling systems with a color-coded dial indicator to effectively assess higher pressure systems and caps. One buyer told us that there are a variety of different adapters on the market, so you might need to do a little bit of Googling if it doesn't immediately fit your vehicle to discover and purchase an adapter that will help to make it work for you. Unfortunately, this cooling system tester did not receive positive feedback from his buyers, with some saying that right away it was faulty- it did not build up pressure because of a leak. Other reviewers concur, blaming Stant for poor quality control, saying that it has multiple leaks that escaped the pressure gauge fitting. The third universal radiator pressure tester we examined is manufactured by GoPlus. Helpfully, GoPlus markets its adapters ability to function with Audi, BMW, Reynolds, rover, Ford, Saab, Mercedes, Nissan, Toyota, Suzuki and many other Japanese and European car brands. One satisfied reviewer said he purchased it to work on an antique car, saying he was satisfied with its functioning, especially because the equipment paid for itself in the cost of a factory technician servicing in one use. The fourth option we examined is manufactured by Astro Pneumatic Tools- it is the universal radiator pressure tester. It's designed for foreign and domestic vehicles and ships with radiator test caps that are color-coded and is indicated to work on a range of different automobile brands including Porsche, Infinity, Mazda, Acura, Subaru, Jeep, Lexus, Isuzu. It's marketed as an easy solution for backyard car enthusiasts to detect radiator system leaks. It ships with a pressure-release coupler, the pressure testing hosed pump, gauge and black radiator cap test adapters. It does work with an air compressor, with some reviewers saying that if you try to set it up with a hand-operated vacuum pump it will take a lot of effort because it requires a ton of compressed air. One professional mechanic has been using this particular radiator pressure tester kit for several years, saying that it quickly detected coolant leaks. Others were impressed by how dynamic it is, the fact that it works as a vacuum filter kit as well as a radiator pressure tester, and the enormous variety of adapters make it a sensible option for professional mechanics and work on a range of different foreign domestic automobiles. The last option we examined is the US General radiator pressure kit- it's marketed as a means of discovering cooling system leaks, whether internal or external caused by by cracked blocks, heads or blown head gaskets. It ships with 8 radiator cap adapters that will adapt to service most imported and domestic vehicles. Because of its enhanced volume pump capacity, it actually reduces the number of strokes required to help pressurize cooling systems. The radiator pressure tester kit will frequently include color-coded radiator test caps that let you easily choose the best test cap for your automotive radiator repair. 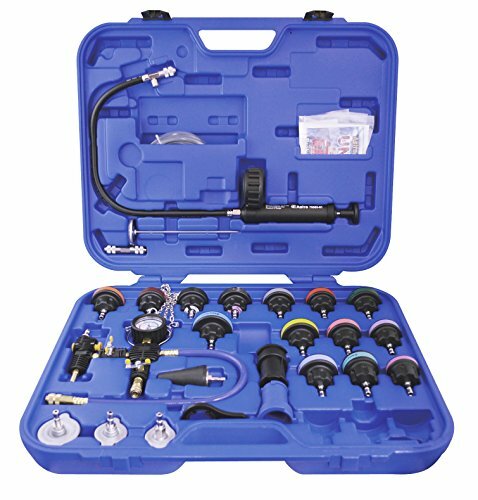 A comprehensive universal radiator pressure tester and cooling system kit will frequently include a testing pump and hose, a coupler that includes a pressure release, a testing gauge (0 - 35 psi), cap test adapters, a universal adapter and a temperature gauge. Accessories will vary by different radiator pressure kits- so make sure you check the product pages prior to purchase to ensure that you're getting everything you need.